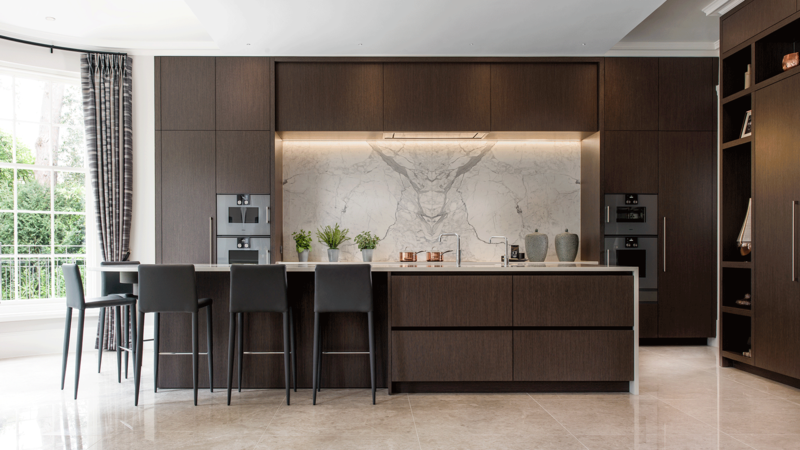 This luxury kitchen is one of the latest additions to Extreme’s portfolio and is shortlisted by Design et al for a 2019 International Design & Architecture Award. This property is a newly built home by Property Developer Charybdis Developments on an exclusive private estate in Surrey, England. The existing property on the land was demolished and replaced with a newly designed three storey home with an expansive basement including indoor pool. 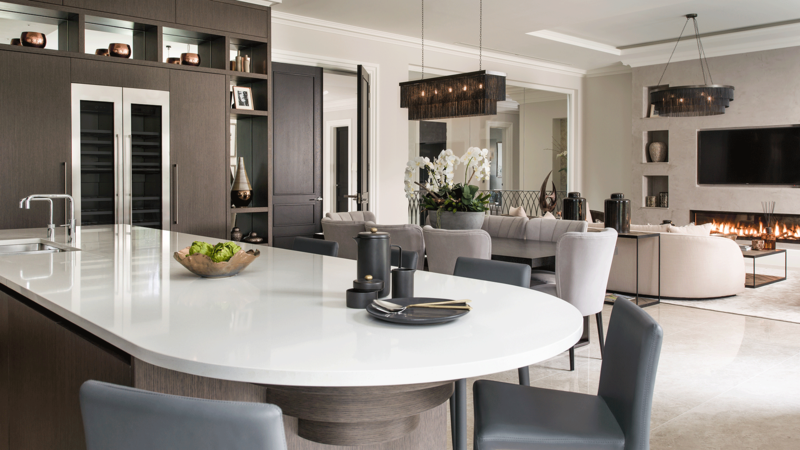 The project was a meeting of minds between Extreme and the Property Developer and Interior Designer, Alexandar James, to ensure that the fundamental design values of the scheme ran through every detail of the home. Extreme designed and installed the main kitchen and adjoining prep-kitchen, along with the basement utility room and staff kitchen. At a time when so many clients seek bespoke and personal environments, creating a design for a speculative new build property required a different approach. Rather than produce a design which expresses the individuality of an individual or family, this design captures the individuality of the property, drawing inspiration from the architecture and interior scheme. The brief was to create an elegant and refined environment that would exude contemporary luxury and create value for today’s market. This called for a contemporary yet timeless aesthetic that had strong visual impact whilst maintaining high appeal, of course it also needed to work within the financial parameters of the project. 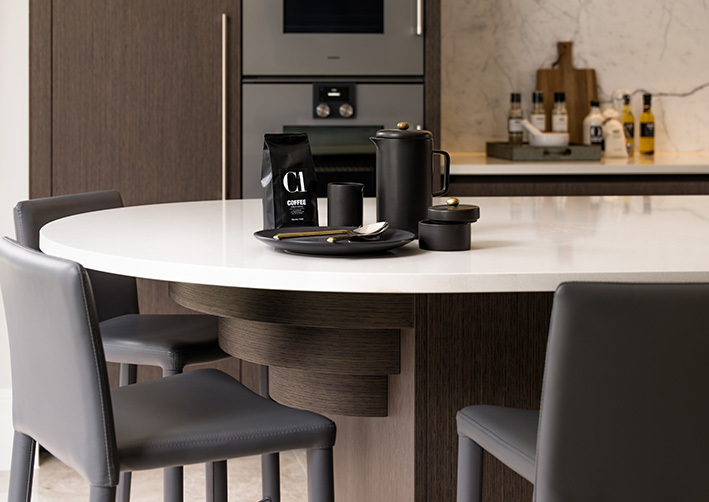 A neutral colour palette was chosen with tactile materials including an individual timber veneer with vertical grain and complimentary marble and quartz in grey tones. 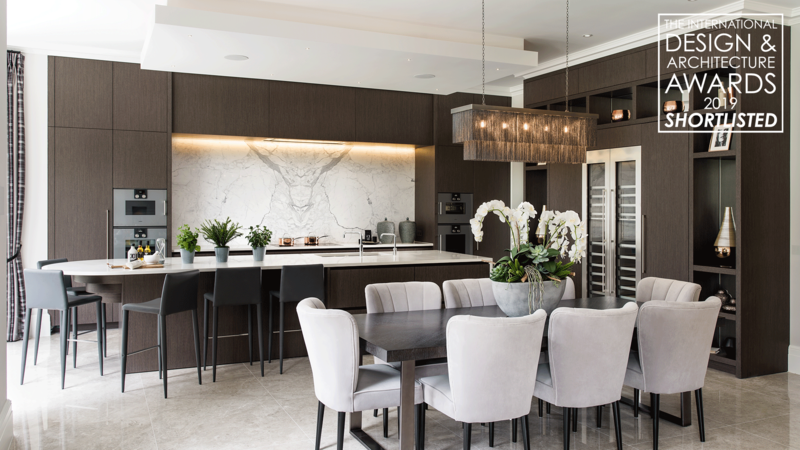 A key principle for the design was to create a kitchen which felt absolutely in harmony with the environment within which it sits, so it had to be designed specifically for the exact dimensions and shape of this room. To embrace the 3.2m high ceilings and accentuate the grand proportions, bespoke cabinetry was designed to fit the height. The island was positioned to sit perfectly central within the bay window and the radius of the bar seating was designed to suit. Design details, such as the breakfast bar support, act as a subtle nod to architectural details within the property with the curves reflecting the adjacent bay window and the stepping detail mirroring a similar detail present throughout the home. It was very clear from the developer how the client would use the room and there were to be clear distinctions between the different zones in this open plan kitchen, dining and living space. With direct access to the secondary kitchen, we were able to make the main kitchen a more visual space and design the cabinetry around the wine refrigeration as a piece of furniture, giving the owners an opportunity to decorate the shelving and personalise the space in their own way. The concept of a large stone splash back was present in the design concept from the very beginning. The brief started more loosely as we knew that a marble with a linear pattern or very directional line would not have the right impact. Although we had onyx and rare marbles originally in mind, as soon as we saw this particular block of Carrarra marble we could visualise how the stone would look when book-matched to create the ‘picture frame’ impact we were looking for, in a subtle and understated way. The book-matched marble acts as a beautiful backdrop piece with the appearance of a piece of art, this is enhanced by the stepped back cabinetry around the hob area which further frames this detail. 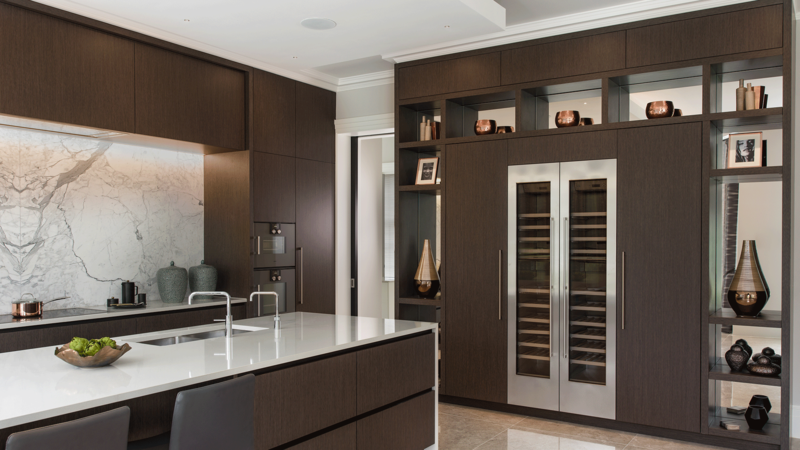 To find out more about this luxury kitchen or our award nomination, contact an Extreme design studio to speak with our design team.